Image: Photka/Getty Images. Design: Ashley Britton/SheKnows. Depending on where you live, Labor Day is often the last chance to go all out with the grill before fall weather sets in. But after a summer of grilling everything from sausages to peaches, those grates might need a little TLC. Most of us don't love deep-cleaning, so facing all of that burned-on food, grime and grease can be more than a little daunting. Luckily, there are some hacks that can make getting your grill back to its best self easier than you might think. You don't need a bunch of fancy equipment to get your grill sparkling again. Sometimes, it's as simple as boiling a pan of water, and if your grill really needs help, you can whip out the big guns (here's looking at you, ammonia!). The most important thing to remember to prevent your grill from getting into a state of disarray after your deep-cleaning adventure? Make sure you actually clean it after every time you cook! After cooking, spray warm grill grates with vinegar. The acid will help break down any fatty residue left on the grates. Then, pick up a crumpled ball of foil with your tongs, and scrub away. Brush off any loosened food bits, lightly oil your grill grates using an oiled paper towel, and things will be clean and nonstick the next time you barbecue. Baking soda is a miracle worker with burned-on food in the oven, and it works similarly well on crusty grill grates. Slowly add water to a bowl of baking soda to make a thick paste, then brush it on to your grill grates. Let it sit for about 30 minutes, then spritz it with hot water and scrub off the burned-on food with a stiff brush. Wipe it clean, oil your grates, and you're in business. This isn't for deep-cleaning, but if you've just got a little mess on your hands, pick up half an onion and rub it cut-side down on your hot grill grates. The moisture in the onion will create steam that helps lift up any gunk (and the smell of grilled onions will whet your appetite!). Steam is a cleaning powerhouse. 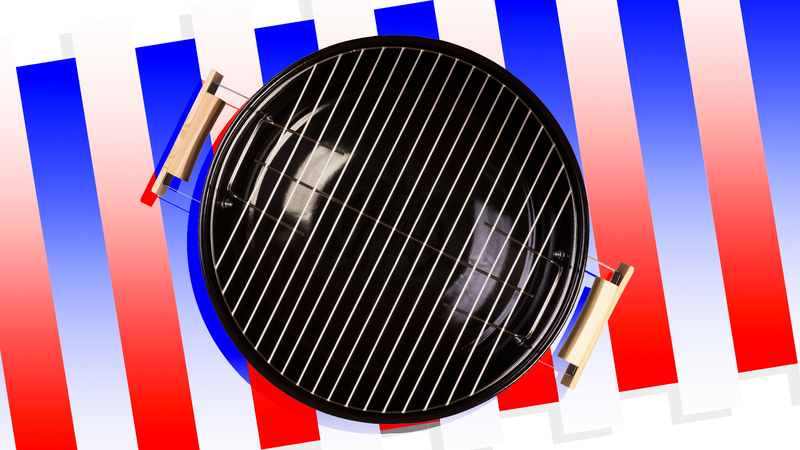 Unleash its power on your filthy grill by dumping a load of wet newspapers on your hot grill grates. This will unleash a torrent of steam. Close the grill for a few minutes so the steam can work its magic, then use your grill tongs to work the newspaper like a rag, wiping off all of the loosened dirty bits. For really stubborn burned-on food, try using Bar Keepers Friend on your grill grates. You can use the powdered or the soft-scrub version. Just like it works on pans covered in scorched food, it will similarly make your grill grates sparkle. This is another simple steam trick. Add a pan of water to your grill, then close the lid and let it boil away for 5 to 10 minutes. Then, grip a rag in your grill tongs and wipe away the grime. If you're facing a "we probably just need to buy a new grill" type of mess, it's time to break out the big guns. Add your grill grates to a sturdy trash bag (don't use something flimsy or it might get punctured) along with a few cups of ammonia. Do this outside and make sure you wear a mask (and never, ever mix ammonia with any kind of bleach product). Close up the bag, and let the grill grates sit for about 12 hours. Remove them from the bag, and wipe them down with a rag, rising thoroughly. The ammonia should have loosened most of the cooked-on matter. Prevention is the best cure for your grill woes. Every time you cook on the grill, clean up after. While the grill is hot, use a scraper or scrub brush to remove any residue, then lightly oil the grill using a paper towel. To prevent food from sticking, lightly oil your grill grates before you cook, and make sure you preheat it every time.